HELLO BLOGGY FRIENDS!!! REBECCA IS CELEBRATING THE RELAUNCHING OF HER ONLINE STORE! AND ALONG WITH THE RELAUNCH SHE'S OFFERING UP SPECIAL TREATS! ADD HER BUTTON TO YOUR BLOG FOR A CHANCE TO WIN HER BEAUTIFUL GIVEAWAY! 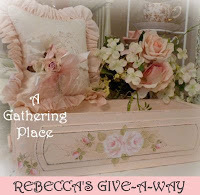 I love Rebecca's treasures, they are just beautiful! Isn't she just lovely. Thank you for sharing, I am going to stop by for a visit. Love everything created by our dear Rebecca. Great giveaway too. I have it posted also. Thank you for stopping by. I always love to see you. Big Hugs to you sweet friend.